Boat and sailing shoes are no longer worn just by sailors. The majority of shoe brands carry boat shoes within their product assortment. 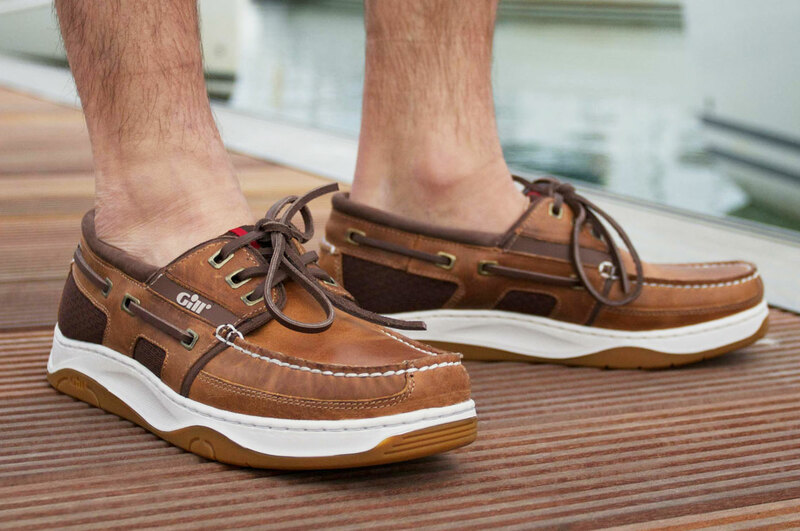 Although these shoes are produced for everyday wearers, much more “technical boat shoes” exist for true sailors, which include many more functional characteristics: Sailing shoes must be able to repel water effectively and be seaworthy enough to be able to grip wet, moving surfaces. In addition, the sole must be designed in a manner which doesn’t leave any space for small rocks to get caught, or leave behind scuff-marks on the deck. The SVB Online Shop provides a large selection of technical boat shoes to choose from. The boat shoe sole – Truly Unique! The most special feature of a technical sailing shoe is its sole. The sole of genuine boat shoes consist of flexible rubber. The sole should make the boat shoe slip-resistant, stable, water repellent and waterproof. 70 years ago, hobby sailor Paul Sperry developed the innovative and widely produced knife-cut sole. This knife-cut profile is perfect for repelling water and preventing slipping with its fine grooves. This speciality sole also prevents pebbles from getting caught, which could potentially lead to scratching on the deck. Only a short time ago, it was necessary that boat shoe soles were made out of light-coloured rubber, in order to prevent dark skids from marking up the deck’s surface. However, due to the intensive development of technical boat shoes during the past few years, this is no longer the case. Nowadays, you can find boat shoes with a wide range of colourful soles, due to the fact that their high-quality rubber compositions do not mark up or cause skid marks on surface areas any longer. But be aware, this only applies to high-quality, technical boat shoes. Moreover, fashionable boat shoes, which are sold by non-specialist retailers, do not necessarily design their soles in such a manner! The outer material, upper portion of the shoe, the interior and the shoelaces of classic boat shoes are usually made out of leather. However, it’s becoming more common for shoemakers to use other materials, such as textiles and membranes like Gore-Tex, in order to increase the breathability and wearing-comfort of modern boat shoes. In the case of higher activity on board, SVB’s water sports professionals still recommend using genuine leather materials, due to their anti-odour properties. Genuine leather shoes can cause blisters on your feet when you first start wearing a new pair, however, once they become softer and broken-in, they will provide you with a high-degree of comfort during any season. 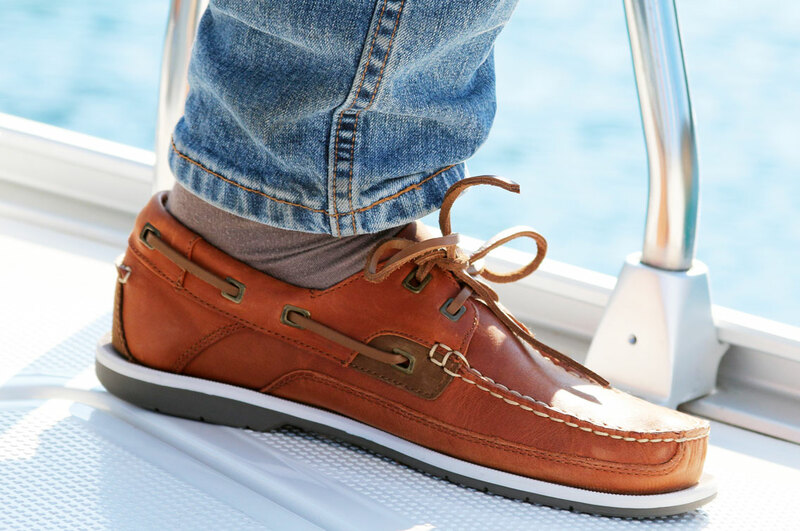 Well-made boat shoes must be made in a way, in which they can resist saltwater to prevent issues such as rust on the shoe’s eyelets from forming. Shoes from different manufacturers and brands often have different sizing and fitting schemes. When deciding between two sizes, we always recommend that you choose the larger size, which also provides the most comfortable fit while wearing thick socks. In addition, boat shoe manufacturers from different countries use different sizing guides. Among others, there are European, British and American sizes. Get used to walking around in your boat shoes for a couple of days on deck, in order to break them in. This is also important because it helps get rid of any wax residue, left over from the production process, which could cause the shoes to be very slippery. How do I take care of my boat shoes? In order to maintain the upkeep of your boat shoes, regular shoe care must be carried out. You can find a variety of shoe care products in our SVB online shop! In order to properly clean your sailing shoes, you must first clean away any dirt or saltwater residue with clean water. This is best accomplished by using a shoe brush or sponge. After this, you should leave your boat shoes out on deck to dry in the sun. As soon as the shoes are no longer damp, we recommend that you pack them with some newspaper and leave them out to dry overnight completely. The newspaper will pull out any moisture from within the shoe’s interior. But be careful not to use too much paper, as this can cause unsightly bulges to form. Once the shoes are completely dry, the leather can be treated. Pay special attention to the manufacturer’s cleaning instructions, due to the fact that not every material is compatible with every cleaning product. Generally, boat shoes made out of smooth leather go very well together with colour-neutral shoe creams. Shoe cream should be applied in a thin layer with a rag or sponge. Afterwards, a chamois can be used to polish the shoes. How can I make my boat shoes shine without polish on board? Simple! With the inside of a banana peel! This also works with greasy face cream, milk and yogurt as well. How do I remove saltwater residue from my boat shoes? It’s actually quite simple! Just rub a sliced wedge of lemon or a halved potato directly on to the shoe’s surface.